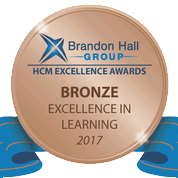 Xyleme and Rogers Communications are proud to win the Brandon Hall 2017 Bronze Award in Best Advance in Learning Technology Implementation. Rogers Communications teamed with Xyleme to better manage nearly 4,000 courses it delivers to over 40,000 learners in the field, their offices and retail outlets. Reducing the cost to create and deliver courses, as well as being able to reuse content and more quickly update and deliver new courses were key results. The Brandon Hall Excellence Awards recognize leading organizations that have successfully deployed programs, strategies, modalities, processes, systems, and tools that have achieved measurable results. Award entries are evaluated by a panel of veteran, independent senior industry experts, Brandon Hall Group analysts and executives based upon the following criteria: fit the need, design of the program, functionality, innovation, and overall measurable benefits. “We are very pleased to have our work with the Rogers team recognized. The Rogers Communications learning team has worked closely with Xyleme to really revolutionize how they create and distribute content. This has been exciting to see,” comments Xyleme CEO Greg Schottland. Rogers Communications is Canada’s largest provider of wireless communications services and a leading provider of cable television, high-speed Internet, information technology, and telephony services to consumers and businesses. With a learning audience of over 40,000 they were constantly challenged with keeping content and programs up to date. The business case for implementing Xyleme centered around efficiency, effectiveness and a desire to bring all course development in-house. After four months in production using Xyleme’s LCMS, 8 out of 10 designers felt they could achieve more in less time. Their fear of losing creativity was replaced by a realization that they were working much more efficiently and producing higher content faster. Continued productivity gains of 130% are expected over the next three years as course output is projected to go from 377 to 894 learning hours per year. Xyleme’s cloud platform enables teams to produce and distribute effective learning content, letting them centralize and manage content, author collaboratively, publishing to multiple outputs and distribute to learning audiences everywhere. With Xyleme as your partner, you can get control of your content and deliver learning at the speed of business. Xyleme is headquartered in Denver, Colorado. For more information, visit Xyleme.com.